Have you struggled to lose weight AND build muscle? Are you tired of obsessively counting calories? Are you fed up with lifting weight 4 times a weeks and still having people ask if you workout (because they can’t tell by looking at you)? Do you feel lost when considering what diet supplements are right for you? Or, eat SO much in an attempt to gain muscle that we end up just… fat. I’ve spent years of study devoted to capturing the wonders of how to use the right foods and supplements to fuel and change your body. 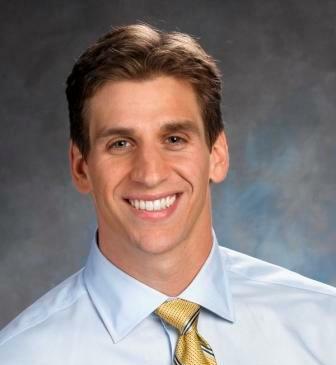 After recieving my bachelor's degree in Biochemistry, I went on to medical school, hoping to change the world by guiding patients’ to take on better eating and exercising lifestyles. However, I quickly realized nutrition wasn't a main focus of medical school or being a physician. A tough decision followed and I left medical school to get my Ph.D. in Nutrition. Fortunately, that brings us to today and to this manual. After being hounded by my colleagues for months to put together a comprehensive manual that outlines the exact steps I have used to melt body fat and pile on muscle for countless people. For months I sat in front of my computer, day after day, distilling down all the effective nutrition strategies that I've taken from research, colleagues, books, clients, and personal experience. When I was finished Your Naked Nutrition Guide was created. trial and error, struggles, and mediocre results. This system has been born after years of my own personal struggles to find good nutrition information to support my desire to improve my physique and build muscle. I got involved in weight training and fitness like many people do, as a clueless high school kid picking up my first body building magazine in the supermarket. Immediately I became hooked on fitness and what I needed to feed my body to obtain results. Just like you, I suffered years of diet wanderings, trying every new headline fad. I remember for a brief period I even drank a gallon of milk (or more) everyday, thinking some magical properties of milk with its added calories and protein would help me build muscle. The only thing I got from that disaster nutritional trial was a lifetime of lactose intolerance! I could go on about my mistakes but that’s not why you’re here. Fortunately, with Your Naked Nutrition Guide you don’t have to fall victim to the same dietary traps and fads that I did. Inside Your Naked Nutrition Guide I show you how to build your own meal plans. I lay out just how to determine when you should eat certain types of foods and how much you should eat. To make it even simpler for you, I have created meal templates. I show you how much food to eat at each meal and you just pick the foods you like to eat. "I get the feeling that you're going to get responses with phrases like ‘effective’, ‘straight forward’, ‘no fluff’, ‘to the point’, ‘no BS’ when people refer to Naked Nutrition. You've taken the most important, and often times most confusing, component of a successful physical transformation program to promote fat loss or muscle gain and have mixed all of the key information down into one of the most concise guides available. The reader will be able to implement your easy-to-follow system the same day they read it. Great work!" What are the three supplements you must take. “What foods should I eat during and after a workout? Why not eating (or drinking) during your workout sets your body up for disaster! NO. 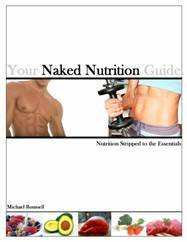 Your Naked Nutrition Guide is a comprehensive nutritional system that lays out for you practical ways to modify your nutritional plan for either fat loss or muscle growth. The best part is that theNaked Nutrition System gets results…guaranteed. I want you to invest in this system risk free. To make this possible Your Naked Nutrition Guide is backed by the Fitness and Nutrition Industry’s Strongest Guarantee. In fact, I'll give you TWO guarantees. If after having the Naked Nutrition Manual for a full 12 weeks, you are not satisfied, just return the manual to me along with a letter stating that you have honestly put into practice the “6 Pillars of Nutrition” (as outlined in the manual). If this didn’t result in less fat and more muscle for your body, I will gladly refund 100% of the purchase price. Unfortunately in this letter I haven’t been able to even touch on the wealth of information found in Your Naked Nutrition Guide but I’m sure you get the idea this system is loaded with practical, results driven, strategies that will propel you to the body you want. To sweeten the “pot” even more, I convinced some of my friends in the fitness industry to provide for you cutting edge strength training programs that fit perfectly with the Naked Nutrition System. To be completely honest just the bonuses alone will convenience you that this system is worth every penny. One of the most in demand strength coaches in the country, Alwyn Cosgrove has written a 4 week hypertrophy training routine that will pack the muscle on any hardgainer. Clients cheerfully pay Alwyn $350 for him to design programs like this but he is graciously providing it to you today for FREE. Certified Strength and Conditioning Specialist Jimmy Smith has compiled a 9 week training program that is designed to strip off those extra layers of bodyfat and then pile on loads of lean mass. Jimmy is quickly becoming the go to guy in the state of Connecticut for results. In addition Jimmy has provided a special link in this special report to 50 more workouts exclusive to Naked Nutrition owners. If you want to get your fat burning started but don't know where to begin with your training don't worry. 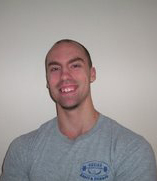 Nate Green, the one all the veteran trainers are talking about, has designed a 6 week fat loss program that will crank up your metabolism so you can drop those 10 pounds to get back to your college weight. Only the next 500 428 people have the opportunity to take advantage of this time sensitive bonus. The first 500 people that invest in Your Naked Nutrition Manual will be invited to a one-time only V.I.P 1.5 hour Question and Answer teleseminar where I will personally answer all their nutrition questions. Normally people pay $100 an hour for my nutritional phone consultation services. But, if you are one of the first 500 then you are invited to receive this $150 value FREE. In case you haven’t been counting, just the bonuses alone are worth over $614. Fortunately, you can invest in Your Naked Nutrition Manual for just a tiny fraction of that. This manual is actually greatly underpriced. At a recent seminar Alwyn Cosgrove called me an “idiot” for asking so little for this system . But I don’t care. I want everyone to have this information. But because Alwyn keeps emailing me telling how stupid I’m being -I am going to increase the price like he recommends. But for now (and I don’t know how long now will be) you can invest in Your Naked Nutrition Manual plus receive the three free Super bonuses and an invitation to the VIP teleseminar (if it is still available) for only $64. Unfortunately there are going to be people who walk away from this offer and they are doomed to struggle with their nutrition. If you are one of those people, I'm sorry I can’t do anything for you. But, if you want to take action today. If you are tired of not knowing what to eat to reach your goals, then act now. I can help change your body. P.S. Remember you can invest risk free because your purchase is backed by TWO, 100% money back guarantees. P.P.S. Act now and take advantage of the VIP Teleseminar where I will answer your nutrition questions.